The man in your life deserves a space all his own, and transforming an ordinary room into a man cave will give him just that. While it’s easy to take a theme too far in the common areas of a home, this is the exception. Go for it with over-the-top details that represent all the things he loves, from sports to beer and everything in between. When styling a room around a dark color, look for inspiration in contrasting design elements. 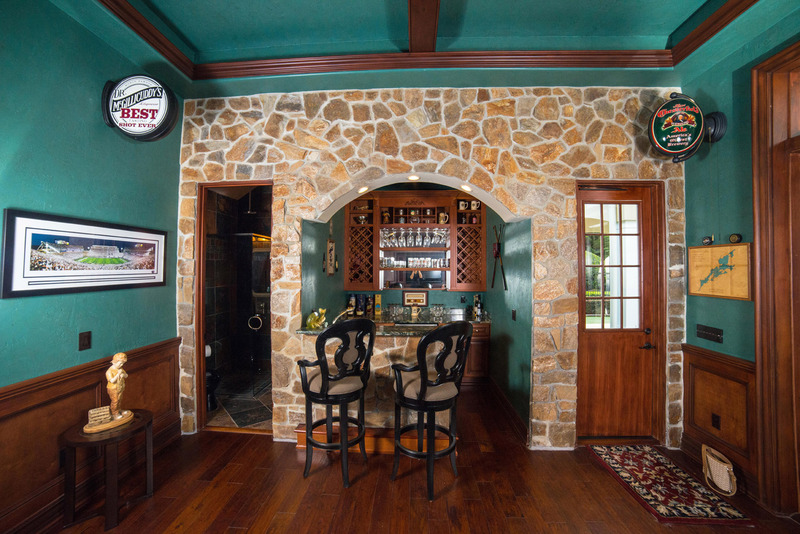 The cream color found in the stone on this accent wall adds height to the ceiling when used to paint the curve of the bar’s archway and brightness to the space without taking away its masculinity. The bar area is multifunctional – a place to breeze through, grab a brew, and move along or a relaxing nook where you can kick back with a cold one. Including bold bar stools in the design keeps you prepared for it all. This custom-made set feels masculine with the dark, distressed wood but also pulls in the creamy color from the stone and the paint in the arch for a high-contrast design. Subtle details can add real depth to even the smallest of spaces, taking the cave right out of the man cave bathroom. A pleated Roman window treatment pulls in the creamy hues of the stone outside the door to balance the dark slate on the walls and floor. Add a personalized piece of artwork, and the masculine theme is brought into every element of the man cave design. One of the most important aspects of a man cave design is personalizing it to the man who will be occupying the space. Add a neon sign of his favorite brand of beer as a lighting element, and get heavy handed with memorabilia of his beloved college and professional sports teams. Go even further with the personal touches by creating a signature element that represents the space. Here, when the sign outside is lit, the family and the neighborhood know The Shed is open for business. The dark wood mixed with the hunter green color throughout the room gives a Scottish-pub feel to the room. The millwork on the back wall provides storage space and a way to hide record or movie libraries, a sound system, and other technical items with unsightly wires. It’s a handsome way to give the guy his gadgets without having the clutter.